Immediately after I finished reading the book A World Gone Social, I was very fortunate to be able to have one of the co-authors, Mark Babbitt, come speak to my personal branding class. Mark knew the entire class had just read the book, so he discussed what he, and co-author Ted Coiné, had learned since the book was published in September of 2014. If you have not read the book, click over to my takeaways to get a brief review of the major points (but make sure to put it on your reading list). There were several direct follow-ups on the book that stood out to me. 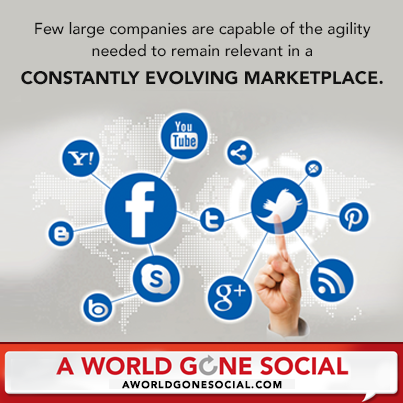 A World Gone Went Social: It is here. While the Social Age is still in the first ten years of existence, it has taken hold and many are beginning to fully adopt the practices and ideas. Phase I for companies was setting up social media accounts and just blasting out information. Phase II has been more social, less media; understanding value vs. noise. Blue Unicorn: The leader who has fully embraced social media was described in the book as a rarity, but there were several great examples. Following publication, many business leaders and CEOs who Mark or Ted didn’t know began to tweet at them about being a blue unicorn. They are out there and more than first thought. Social is the mindset now, not just Twitter and Facebook: With so many different platforms, companies are no longer just thinking about Facebook advertising or one specific platform to create an account, but thinking about their entire social media presence. After seeing more examples of different hierarchy styles, Mark prefers a holacracy system over a flat system. OPEN (Ordinary People, Extraordinary Network): Starbucks no longer has a research and development arm as they started their own crowdsourcing platform to have customers give ideas. They are now a leader in crowdsourcing with over 150,000 ideas being generated a month; including the nifty green sticks that prevent coffee splashing around in the car. This puts “the right people, in the right room at that right time” by going digital and putting it on a central location. Crowdsourcing is used to find those ideas and the community itself monitors the idea box. A young man walked into a Target looking for a clip-on tie. The store had none, but an employee taught him how to tie a real tie. Before the young man left the store, the photo taken of the interaction had already gone viral and Target was inundated with great press. For a Super Bowl commercial, McDonald’s asked customers to do something nice instead of paying for their meals with money. The commercial that aired showed some excellent customer responses. However, several cell phone videos showed what happened when things didn’t go well and accounted for some awkward situations. What we say about us is marketing, what others say is our brand. We are in a testimonial economy and it is all on social media. Be a relentless giver. Share your knowledge as a gift. Make those around you stronger. There is power in building a community. Enable others on purpose. There are hiring mistakes. We have learned that in the last six months. Even the people who have been there 20 years. If they are not willing to change, then they have to go. Hire really good people and trust them. Give them a voice and make them happy. Those employees are thing going to treat customers well. The biggest lesson I learned from Mark’s comments was that the world truly has already moved into the Social Age. Now, it is only a matter of getting bigger and more efficient. If you haven’t already, check out my biggest takeaways from the book by clicking here.